I have a few quick links, videos, and Kickstarter innovations that I’ve been saving up, so I thought I’d consolidate them on today’s post with some commentary from me. 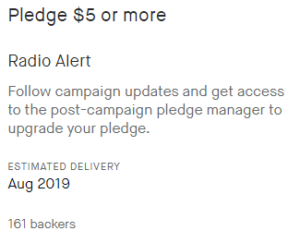 With an increasing number of backers pledging $1 to gain access to a project’s post-campaign pledge manager, Grey Fox Games took an interesting approach with their current project: They charged $5 instead. I think this is an interesting approach to the perceived problem (as I wrote about here, I’m not sure it’s a problem for most creators). I think the result is that they have more confidence that the backers of this reward will later upgrade their pledge, and I’m curious to see if the data backs up that hypothesis in the long run. Fellow creator Ed Baraf has a YouTube channel on which he talks about games but also discusses various business-related topics and interviews people in the game industry. If you’re a creator, I highly recommend subscribing to his channel. The latest video hits close to home, as Ed chats with Mike Pascal of Peachstate Hobby, one of the nicest and smartest people working in the game industry, about what happened recently with Wingspan. While I don’t agree with everything they said, I appreciate that they offered their perspectives on that situation. Skip to around minute 24:00 if you want to get to the Wingspan content. You may know from blog entries like this and this that “hype” is one of my least favorite words. Despite those blog entries, though, I’ve never explained my reasoning as anywhere close to as well as Rodney (Watch It Played) did in the video below. He happened to use my game, Scythe, as the example for this video. My response to the video is detailed in the top comment on the YouTube page. 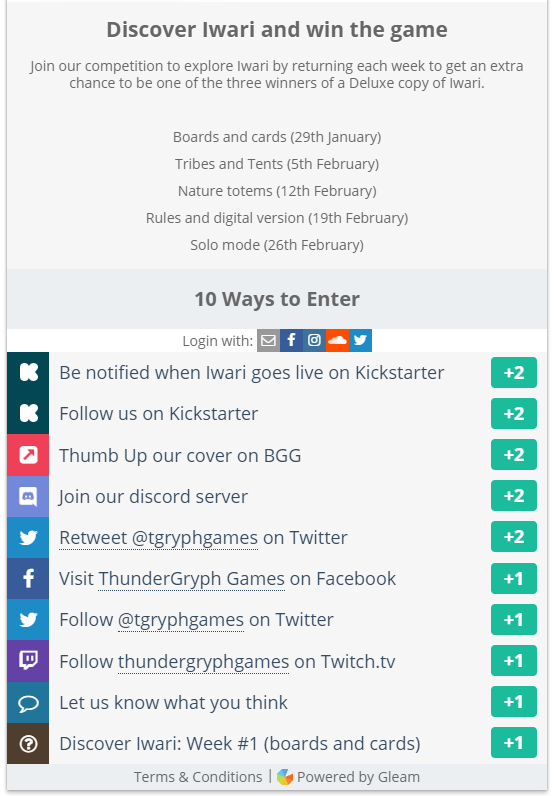 I think that Thundergryph Games is an industry leader at social sharing. Their method make people feel good about spreading the word. For their latest game, Iwari, they seem to be using a service called Gleam to encourage different types of sharing. It’s very clean and easy to use: All it requires is a few clicks, and for being as simple as it is, each option is surprisingly engaging. You can see it in action here (the following is just a screenshot). If Gleam is as easy to set up as it is to use, I’m very curious about using it in the future. I don’t even really care about the contest element–I just like how all of the social elements are consolidated. Mike Minutillo of Kick the Table recently posted a great video that looks back on 2018 tabletop games on Kickstarter. I’m really impressed by the depth of his analysis–he must have spent quite a bit of time putting together this data. I’d love to hear your thoughts in the comments about these videos and techniques! I’ve seen Gleam in action and in fact I won a game through Gleam. I hardly ever follow the Gleam links because they feel very spammy to me. For the Gleam pages with a few clicks, I find it works well, however, some are using the Gleam links with several possible clicks…It feels like it’s way too much. Just clicking the Gleam links doesn’t mean I engage with the site linked. It just means I’m clicking to gain additional “points” to up my chances of winning the contest. Board Game Revolution uses Gleam a lot and has an overwhelming number of clickable options on a lot of their contests. This is a good point — As a digital marketer, I always have a goal with each one of my “calls to action.” In this case, they should all be about spreading the word. Using the above screenshot, there are a few requests that I feel are noise and don’t advance the cause of spreading the word to others. Some try to engage the user themselves, but they are already engaging trying to get points to win your thing. I see the more valuable of the calls to action to be what spreads the word to their networks (with the notable exceptions of following on KS/Getting notified on project launch). People are only going to click a limited number of these, so by only offering options that further the cause, you’ll get better results. … don’t further the cause. I am not trying to criticize these awesome fellows, but just wanted to use an example that we all have here to illustrate. Most of their options are great! Please research Gleam before adopting. I never participate in any Gleam promotion, after my first use resulted in an influx of Spam, due to their gathering of personal information and potential privacy violations. Hello Kent! Sorry to hear you had a bad experience, I know gleam is quite strict with the privacy policies. I think it all depends on how your data is stored and used. With us, only if you want it, you can opt in to receive a one time newsletter to be notified about Iwari. That is how we have managed it for all our campaigns. 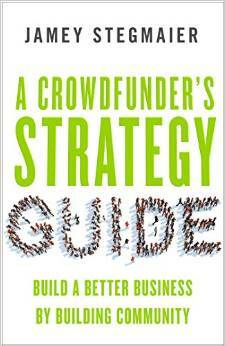 Mike video was quite interesting, there is a lot of valuable information for Kickstarter creators! Jamey, thank you for the mention! I’m glad you found the experience interesting. We tried out Gleam for The Reckoners. Ultimately, we ended up with some good results (social media shares, likes, email sign-ups, etc. ), and I think we will continue to experiment with it for future campaigns. First, their methods encourage very low quality traffic. When it first started being used for giveaways in boardgame FB groups I’m in, I was all in. I worked for as many entries as I could for cool prizes. But I almost never ended up simply backing a project, or following a creator because I was interested. I just clicked the buttons like a monkey with ADD, following Instagram accounts even though I don’t use ‘gram at all, did the same on Twitch (also don’t use), and followed twitter accounts using a garbage handle that was created just for contests. I know I’m not alone. I suppose for people that actually use those services you might get some decent adds, but a couple months of Gleaming had my accounts so stuffed with channels and content that it would have driven many actual user crazy. Second, while their terms of service remind users to check their local laws, they do nothing to help with that or encourage following through, and it’s a problem waiting to blow up. I first realized this when I started seeing content creators with Twitch Prime channels and other paid subscriptions that offer huge numbers of Gleam entries only to paid subscribers. In most of the US this is technically an illegal lottery because you are giving people that pay a better chance at winning. When I approached one small group that was running what they called “sweepstakes” through Gleam, they didn’t want to believe it and blew me off. When I asked Gleam about it, they just referred me to their ToS that basically said “check your local laws”. I wouldn’t be surprised if this eventually led to a situation like the one where “celebrity influencers” were dinged by the government for endorsing products without disclosure of payment. In the end I stopped participating in Gleam for those reasons, and because I’m not comfortable with it taking over social accounts to post stuff for you.